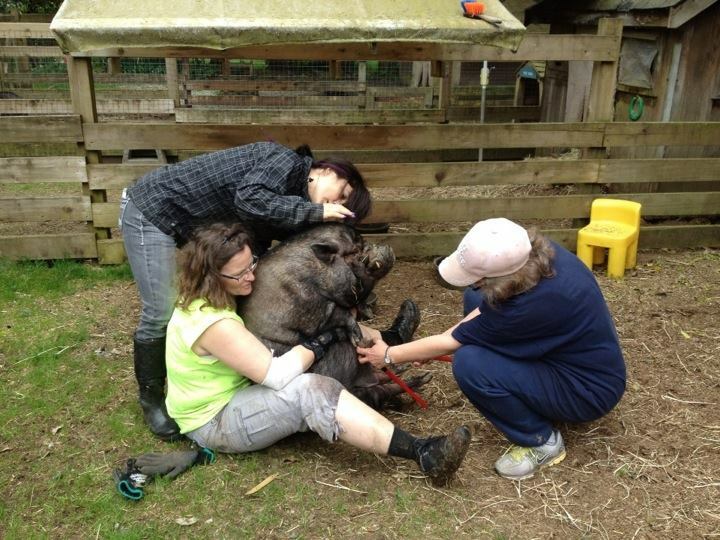 When it comes to hoof trimming, we do our own as taking pigs to the vet is not only a big job, it's also stressful for the pig. Very few vets like pigs or know how to work with them. Even fewer know the correct drugs to use for sedation. So in a one pig home, you can try what I do for my house pigs. The trick is not to rush. I buy a big box of Cheerios to provide a tasty distraction, keep my clippers on the counter, and if it takes me two months to get those hooves how I want them then it takes two months. Over and over, I just go for the hoof the pig puts down in front of me as he or she goes back again and again to their pile of Cheerios. And yes, I do get sore knees crawling around! You need to do this with the pig on grass or carpet so the cutters can get under the hoof. And you can't take too much at once as the hoof is too hard. So it's little slices, bit by bit. The pig will move, so just go for the hoof that is closest. Check out the first video on the right to see how it's done. To help you prepare, next time you do belly rubs investigate the hoof and get a nail or something and pick or scrape at the hoof to see where the good tissue starts and ends. I know my heart was beating a mile a minute years ago with my first pig, but you must try and put your feelings aside to work with these guys. I have over 40 pigs here and only one out of all of them will actually "let" me do it. They all dance around or scream murder if I have to use the sit down method. Another method involves a little "beer sedation." If necessary, you can safely give your pig a beer or two an hour before you start. This is the method that was used in the second video on the right.